Notes: Turner A61. "A cairn with a large centrally placed rock which is possibly the capstone of a kist. Robbers have excavated around and about this giving a rock strewn central hollow to the cairn. There is no encircling ditch. The capstone is approximately square. Touching its base at the east is a triangular shaped orthostat. The cairn is situated on the very summit of a hill." Notes: No NMR listing. HER record MDV18865. Described in Butler Volume 1 Map 20.3. To the south of Berry Pound is a small longhouse. "Within the abandoned field 250m south of the longhouse are the probable remains of a single row first recorded in 1983. 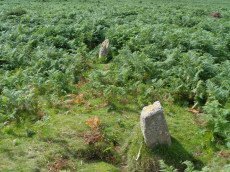 Five or six stones remain in line up to 206m apart, the rest having been removed or buried when the field was ploughed."